– RAD products are designed to clean, not remove old deck stains. 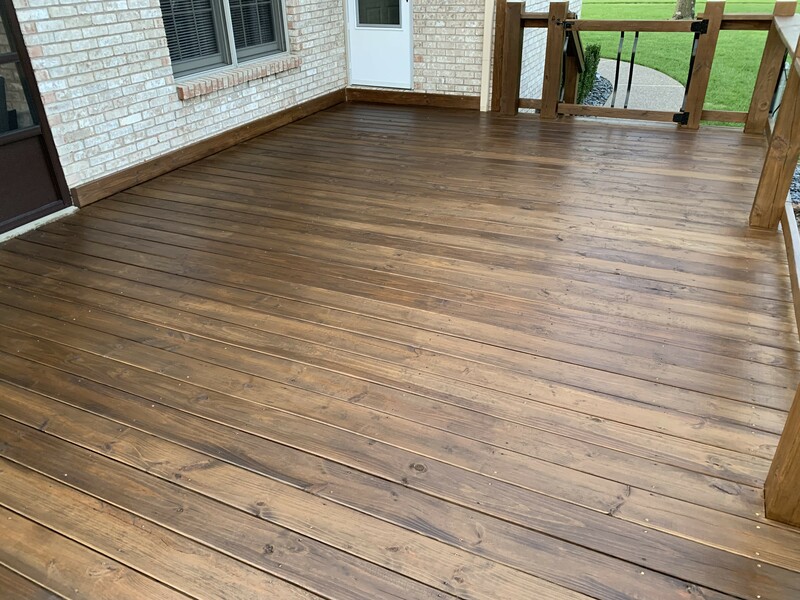 We would presume that they would remove a deck stain if the stain has deteriorated drastically. – RAD does not come in a liquid. You need to measure 6 oz per gallon of water mix the entire 2 lb. container into 5 gallons of water. This product does apply easily with a garden pump sprayer. We needed to make sure to mix at the correct dosage otherwise, the powder did not completely dissolve. Testing was done with both scrubbing and pressure washing. Both worked well. Step 2 brightener does not need to be scrubbed, just rinsed with water after 10 minutes. 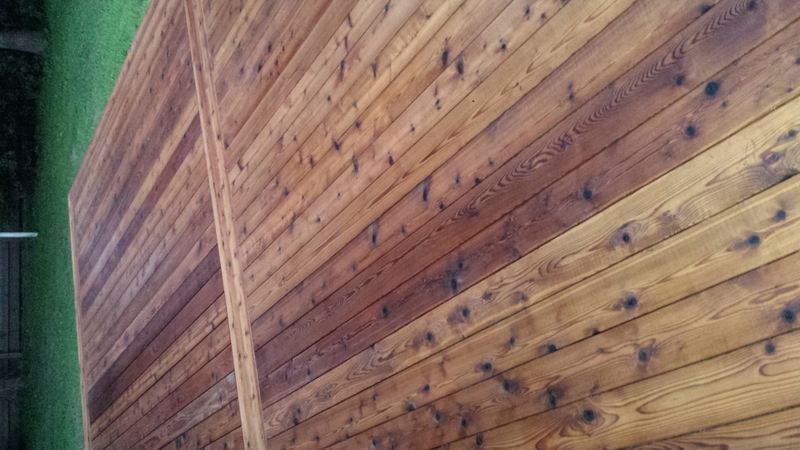 – The IPE wood deck looked brand new after cleaning and drying for 2 days. We would have given this a score of 10 if it was not for a couple of minor water spots that did not come out. These spots looked to be from planter boxes. 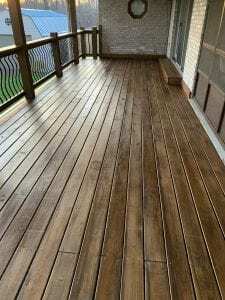 – Restore-A-Deck makes a great and economical product for reviving your deck to like new condition. We really like that kits contained both the cleaner and brightener. This was easier than buying the products separately. 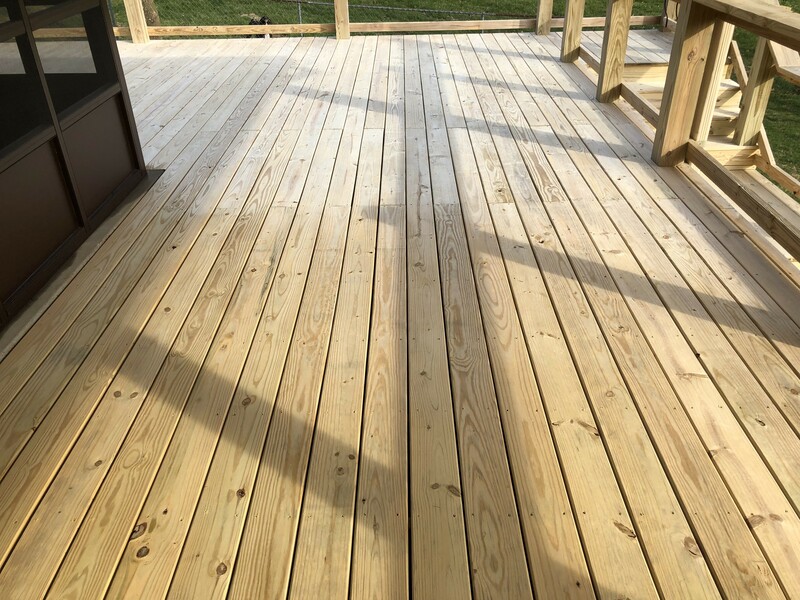 Are there any BRIGHTENER products available for Trex wood decks? A product to apply post Powerwashing?? A brightener will not work or have any effect on Trex. Hello! Quick question here. 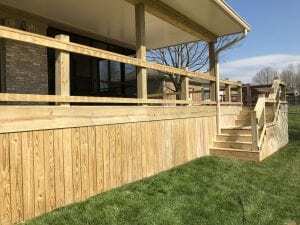 Our fence was installed about 9 months ago and I’ve recently power-washed it using some basic deck/fence cleaner and I’d like to use Restore-a-Deck in the natural finish. Is it mandatory that I buy all the cleaning and prepping products as well since I just cleaned? Thanks! As long as it is clean and your rinsed very well when done, you can go ahead and stain. Good to know, thank you for the super quick reply! One more thing though (fyi, this subject is far from my strong suit!). 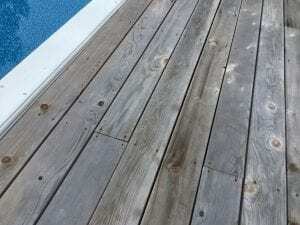 When I power washed today I noticed some boards had what looked like graying in small patches nearest the bottom of the boards or where they intersected with the lower horizontal board. Some looked a bit moldy/dirty, but not actual dirt. Not a lot, but enough to notice. I had never used a power washer before, fyi. Started with the 40 nozzle to rinse and it wasn’t taking any of the dark spots off so I switched to the 25 (maybe it was 20?) nozzle and it sort of removed some of the areas but I felt like I was risking ruining the wood if I got any closer. The fence is near dry now and some of those areas are still there, and I’ve already returned the power washer to its owner. Perhaps I do need some additional cleaning supplies and a stiff cleaning brush to fully remove it, or can I stain over it? My head is spinning….I’m MUCH better in the kitchen making delicious baked goods, ha! 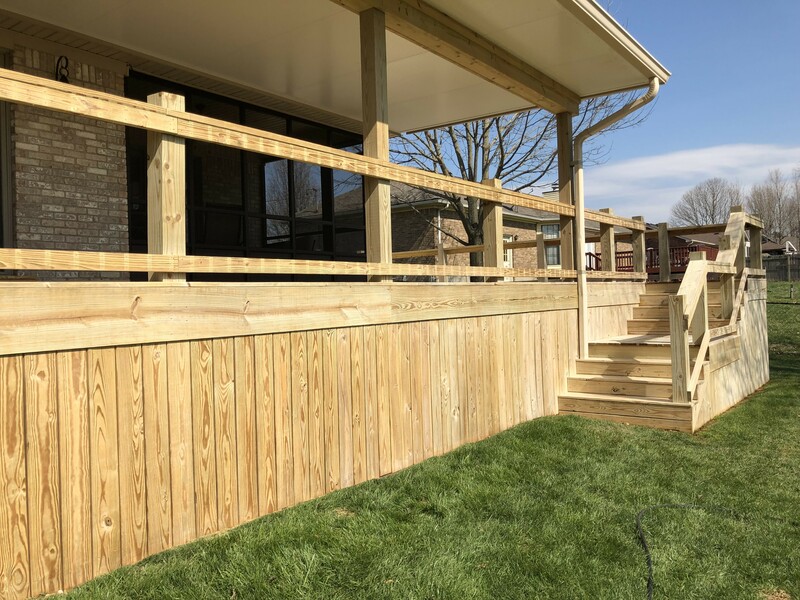 New 600 sf second story Cedar deck installed last Summer and stained with Armstrong Clark oil-based semi-transparent stain. 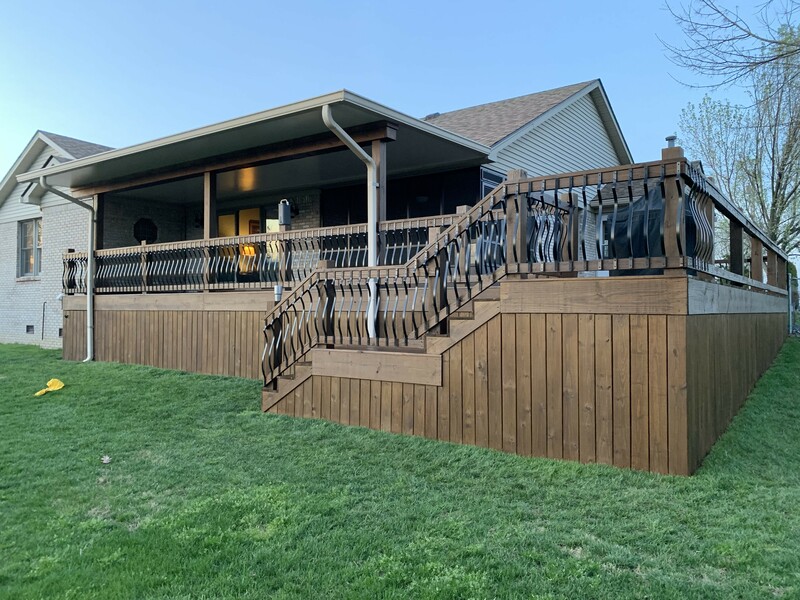 The deck looks really good but since it only has one coat of stain on it I want to give it another coat of stain this summer. 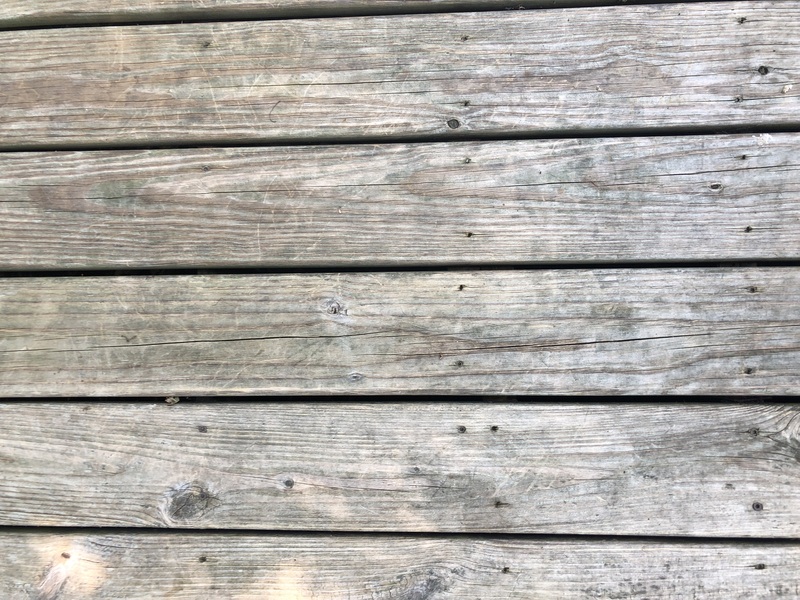 I used Restore-A-Deck on it last summer before staining and it made a huge mess of gunk on the underside of the deck the siding on the house below and the patio below which took a very long time to cleanup. It also damaged some of the windows below it, the glass, as confirmed by the professional company that cleans my windows. I see you recommend Restore-A-Deck for cleaning but based on how good of shape the stain is on my deck and mess/damage it creates below can you recommend something that wouldn’t make such a clumpy mess below? When new wood sits for a few months or longer it will oxidize from the sun. 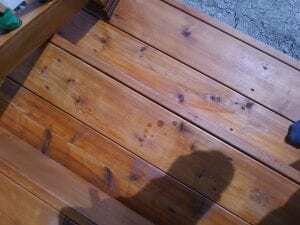 This oxidation (graying) is then removed by a deck cleaner. It looks like wood fibers and has to come off prior to staining. The RAD is not the cause of this (any deck cleaner would have had the same result) but helps to remove the oxidation from the wood when you do the prep. Always rinse well when you are done to make sure the wood fuzzies are not stuck on the house, etc. This oxidation removal only happens when the wood is silver or gray and not stained so it should not happen again. It is good to go and will look great when stained. Ok great. Thanks again for your help it’s greatly appreciated and you have a great site! Going with RAD dark walnut stain. Try applying to damp wood. Much easier. Only one coat as well for new decking. 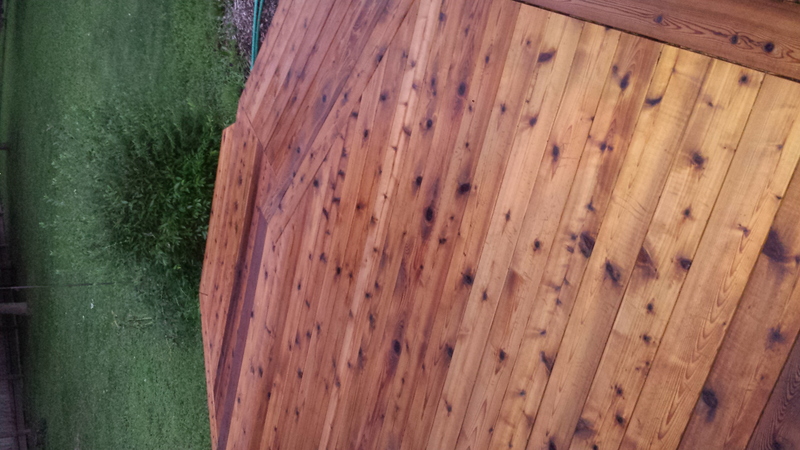 I’m no professional and this is a huge deck but I did two coats on it and it turned out pretty good in my opinion. Not perfect but I worked it fast. Thanks for all your help. I’ve already recommended you site to a few other people for the wealth of knowledge! I used RAD today. It took all day on my large deck. As discussed on another post half my deck is covered. When I used the Brightener it looked great while it was wet. When it dried its back white again and the part thats covered looks chalky. Is this normal and is it ok to go ahead with stain? It’s a one year old deck thats never had anything done to it. do you need to clean and brighten after media blasting? Probably not as that process scores the surface and roughens up the wood. 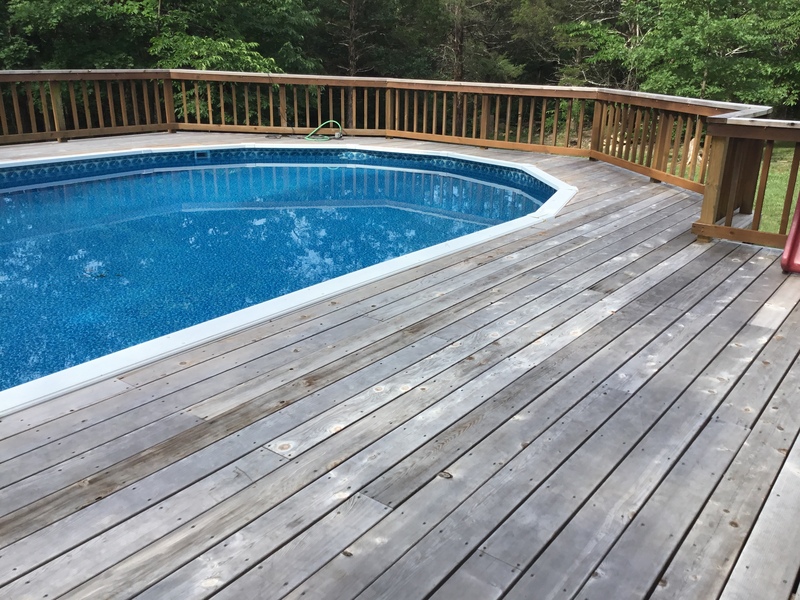 My deck has a white film after applying, waiting 15 minutes, brushing many times and washing with a hose. I put the brightener on hoping that would remove the white flakes. Any suggestions? The white is oxidation of the wood fibers that need to be removed after applying the cleaner. Use a pressure washer or heavy scrub more effectively. Would like to use RAD Step 1&2 on a fence. Will either product kill our plants? I don’t believe so but it may brown some leaves if you do not rinse off the dirt and soap residue. 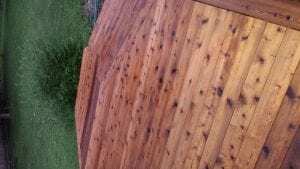 For a 2000ft deck how much restore and brighten kit and Armstrong hardwood stain do I need to get? And where do I get these products? 1 prep kit and 1 gallon should work on a hardwood deck. Check with RAD or online. I just installed some new cedar siding consisting of lumber that has been sitting around for several years. It has all been sanded with 80 grit. Can I apply a solid stain such as Flood at this time or must I allow the wood to weather?? Wait and month and clean and brighten the wood before using the solid stain. I used an oil based clear sealer about 4 years ago. 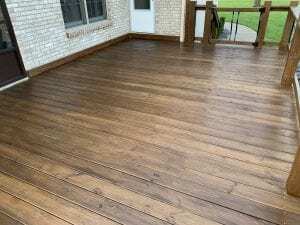 I bought your complete kit, pressure washed the deck which removed the majority of the old finish and left a light residual coating. I used your stripper twice on one board to test and all it did was trun the old sealer to a gummy mess that even the pressure washer won’t budge. I applied stripper again, let it sit for 30 minutes, scrubbed with a fairly stiff nylon brush. again it turned to a gummy mess that the brush would move around but it can’t be washed off. Please post a picture of the board you are having an issue with. I plan toter this board over and not use stripper in the rest of the deck. That is raised wood fibers, not old stain. Just sand this board at 60-80 grit to remove the fibers and you will be okay. Sorry but no it is not. You are seeing wood fibers, not sealer or stain. When the wood is over stripped it will do this to the wood. Sand it and it will be fine. 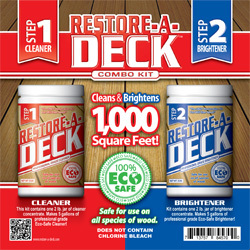 Is there a deck cleaner and Brightener that is recommended that can be purchased at a common retail store. We need to clean and then stain just our rough grain rafter boards before it rains on Saturday and next week. We want to get our roof up next week. I didn’t realize that restore a deck can only be purchased online and not in WA. Try Defy Wood Cleaner and Wood Brightener. Can this product be used safely on a pier thats in the water? Is it safe if the product ( cleaner & brightener ) is rinsed off the wood pier into the lake water? Yes, it is eco-safe for water. 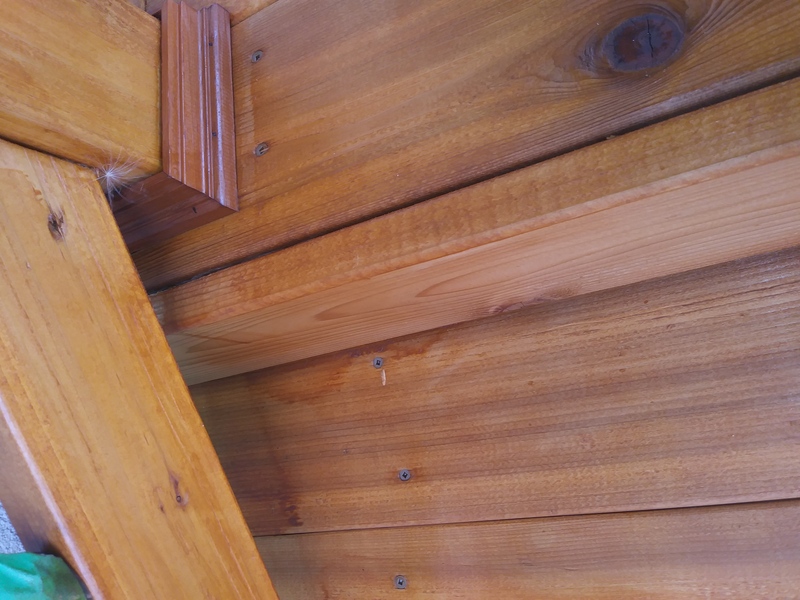 How important is it to use the cleaner and brightener on my new deck banister spindles (2×2 rough pt pine? Creates a lot more work for me – (2nd story and older man- ha). Thanks, Lyle.. Very. You need to remove the oxidation and mill glaze. 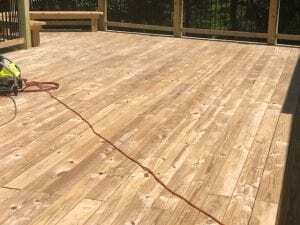 Deck stain strippers will not remove solid stains fully. 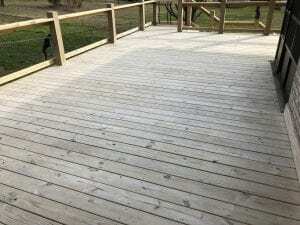 I replaced the deck boards on my 600+ sq/ft deck earlier this year using pressure treated pine. I am now ready to apply a water sealer but want to clean it first. I live in Florida and we are in the hot season now. Is there any issue applying this product in the heat, or should it be applied in cooler temperatures? Also, how long should I wait before applying a sealer – like Thompsons Water seal or something comparable? Best to do in temps that are around 85 or less. Works better and easier for you as well. As for a clear sealer, try Defy extreme clear. You can do this after the prep. Thank you for your quick response. After reading the reviews, I was leaning towards the Defy Extreme stain, and using the Restore-A-Deck cleaner/brightener to prep. 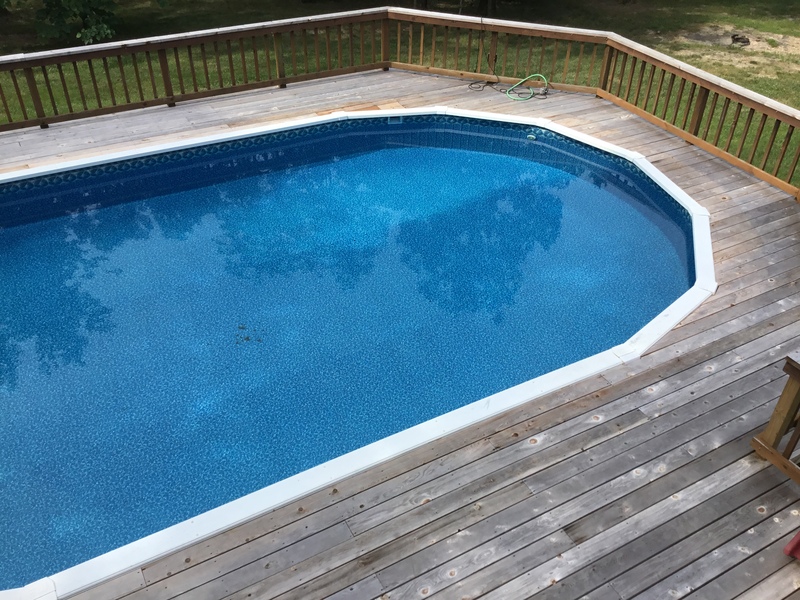 A couple of other questions – I assume I should cover the lower 2-3 feet of my siding (painted hardi lap) with plastic to protect against over-spray. Do you also recommend using a paint brush for the stretch that butts up to the house? Also, I had a stainless steel rail system installed using 4×4 pine posts with pine board top rail. 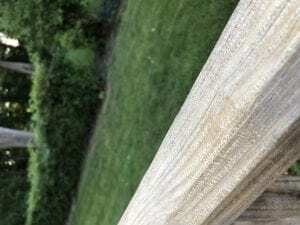 I think I should also just use a paint brush to apply the stain on the railing instead of spraying – do you have any other suggestions? And, does the type of brush matter? Also, will the cleaner/brightener harm the stainless steel? Lastly, my house is on stilts and the deck extends out over the garage. I am thinking I should go ahead and clean and stain the underside as well even thought it gets less exposure to the weather. Do you recommend doing this? Thanks for your help and for creating this web site – very informative and helpful. Use a deck stain pad for applying. The prep products should not harm the railings. No need to stain the undersides unless you want for appearance reasons only. Thank you again for your quick reply. You have been very helpful. i have cedar deck previously stained with a Behr transparent stain. It is flaking and would appreciate recommendations for how to proceed with prepping and restaining. Thanks. Anyone used this on a redwood deck? Mine looks like the before photo above, it’s about six years old. Yes. No issue with redwood. Make sure to use the Step 2 brightener after the cleaner. Used the stripper and brightener today. Deck isn’t even dry yet but very happy with how fresh it came out, however now we have a lot of ‘hairs’. Especially on the railing. Do we stain as is or need to sand? 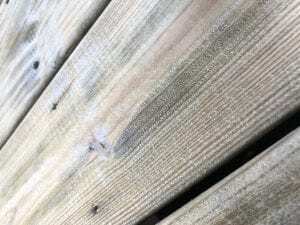 Not all of the decking boards have it, or seems concentrated to a few boards… but the top railings are bad. Found few stain droplets fall on the deck while staining. Found out after it dried. What grit sand paper do I sand it off? Do I do it manually or use rotor sander? Some areas applied thicker than others, what do I do. Wait till next year and top up even ? What stain brand? Post a picture. For the drips, You cannot spot fix this. Best to redo that entire step. Sand it off and recoat. Yes it was weathered for about 3 months . Moisture meter showed less than 12 pct . I think the wood was sitting in storage for a while for moisture content to be that low. 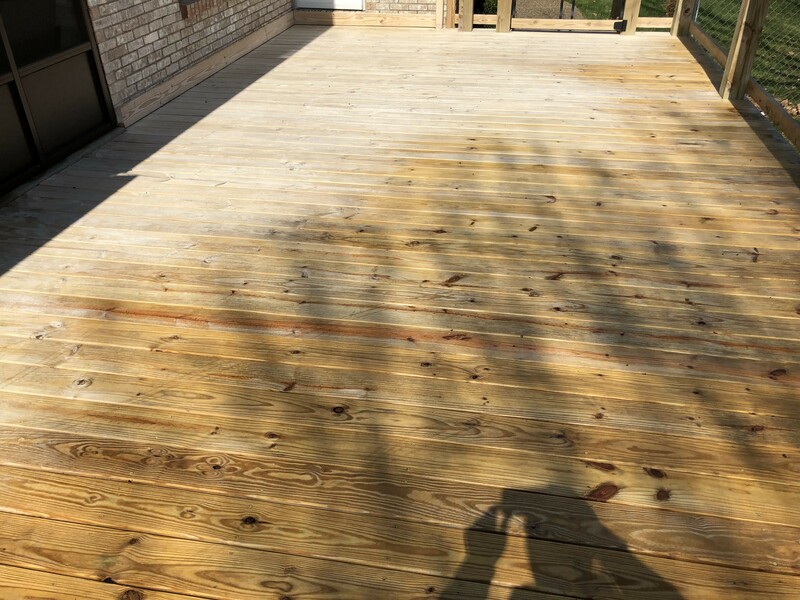 The wood was cleaned and brightened using Restore Deck cleaner and brighter . What grit sand paper do you recommend ? Thanks. Based on the picture you don’t think it weathered enough? Not really. TWP wants 4-12 months. Looks like it may not have soaked in very well since it was only 3months. Not the end of the world though, just clean and reapply a light coat next year if needed. Was planning on doing another stain next year . Thanks for all your help . I do not know if my deck was previously stained. Moved in last year and had a new baby – finally getting to the deck! I cleaned it thoroughly with a power washer, here’s what I’m working with. Should I use cleaner or stripper before the brightener? Use a stain stripper and then a wood brightener. Didn’t use the system. 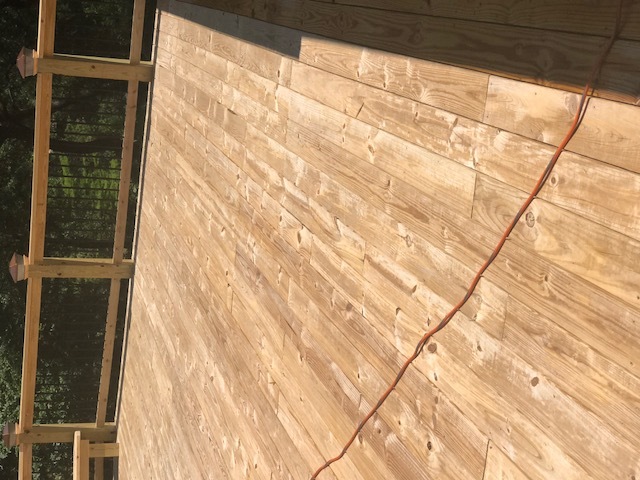 Used the RAD stripper on a cedar deck and then the RAD brightener. After spraying on the brightener the change in deck appearance was almost instantaneous. 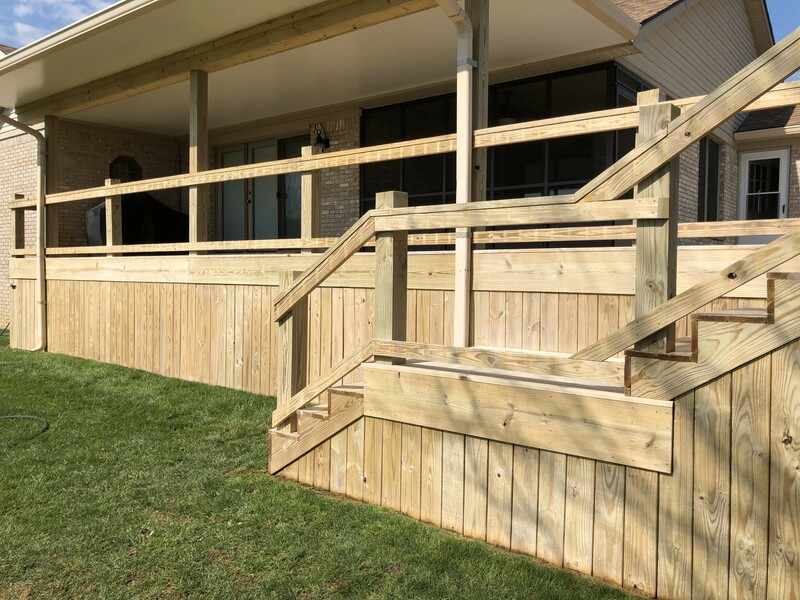 This product made the labor of stripping a deck worth the work. Definitely satisfied with th he results. Pics of the deck about 2 hrs after brightener was rinsed. Used the RAD Cleaner and Brightener. 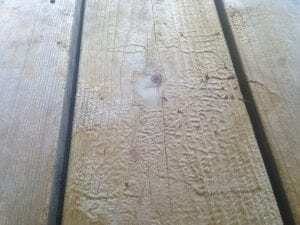 The cleaner has left few white spots which can only be seen on wet wood. Even after applying the brightener the white spots don’t seem to go away. Planning to stain this weekend. Should I sand those areas or it wont show up when staining? The deck is 10 year old in Nova Scotia, Canada. Within 15 yards from a ocean bay. good shape with heavily grayed. My guy will pressure wash the deck. Is pressure washed required? Yes, you have to prep and use a deck cleaner. Pressure washing will make it easier. 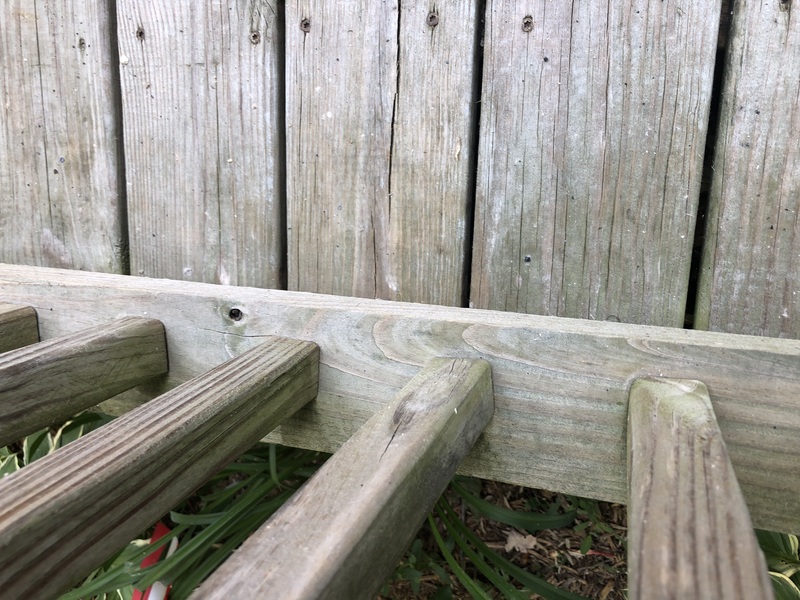 I have an old deck that has minimal stain left and the railings do still have some left on it. The deck has not been done for probably 10 years. There are some boards that I think need a sanding and it is dull and needs help. What order do I do the process when I want to sand. I just received today the stripper and brightener. What is the best say to proceed. Strip and brighten for the prep is a good start and hopefully will work for the prep. Any issues with that, send us a picture. 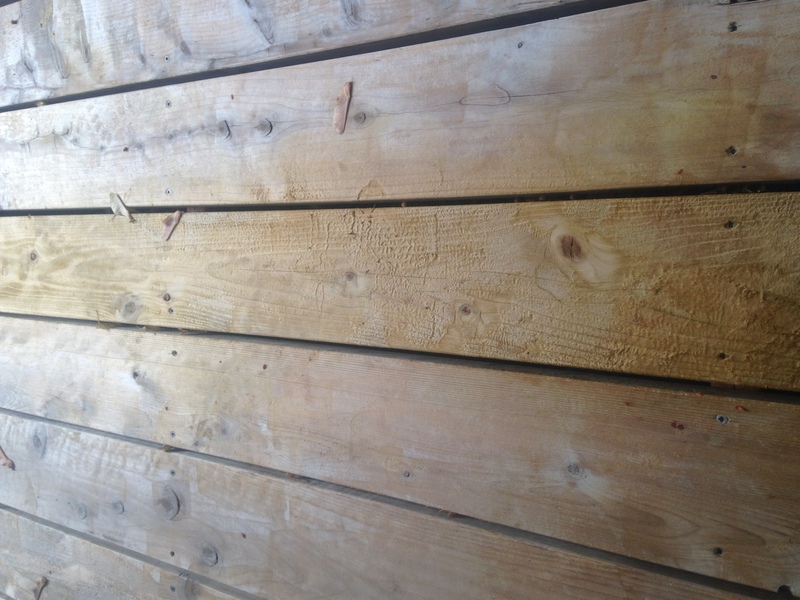 I stripped the stain off our 5 year old deck and then brightened (both with RAD). Decided to sand it afterwards to remove feathering. OK to just use brightener again before staining with TWP 1500 or should I lightly strip first then brighten? Thanks in advance. This is a great website! Just brighten and rinse well with water. What is best way to use cleaner/brightener on railing. Using a sprayer seems like it will waste a lot. Will brush application work also. Since I would not be able to finish all the raining in 20 minutes, or perhaps even an hour, should i do the raining in sections. You will have to spray and then pressure wash off. We built our deck with pressure treated cedar about 10 months ago and it has weathered as seen in the photos. We plan to use the RAD cleaner and brightened at this point. I am now shopping for stain. 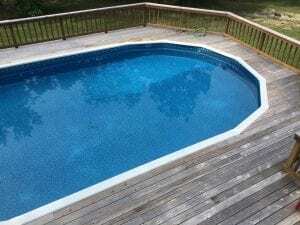 My question is: should we use an oil based or a water based stain for our pool deck. We live near St Louis MO. I have a mix of new pressure treat lumber and old stained wood (pressure treated as well) in the same repaired deck. I want to use semi transparent stain. Do I need to use a stain stripper in prep since some of the old wood was stained? Thanks! -All previous coatings will need to be removed inf switching brands. If I clean a deck today, do I need to brighten the same day? Next day? A few days later? Hello, I am restoring my never stained deck and staircase. I used a power washer on it because of the extreme mold and mildew on much of the wood. I have been reading your site and will be using the Brightener you suggested. 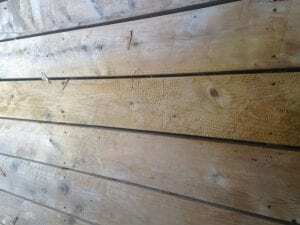 My question is because of the firing due to the power washer in of the boards I want to do a complete sanding with a floor sander, and I would like to know if I should brighten the boards before or after I sand. I have read on some blogs not to get the boards wet at all after sanding and some it doesn’t matter. Your help will be greatly appreciated. If you sand, do the brightener and a light pressure rinse after. Water doesn’t harm sanding and in fact helps by swelling the wood pores. The more absorbent the wood, the better for wearing. 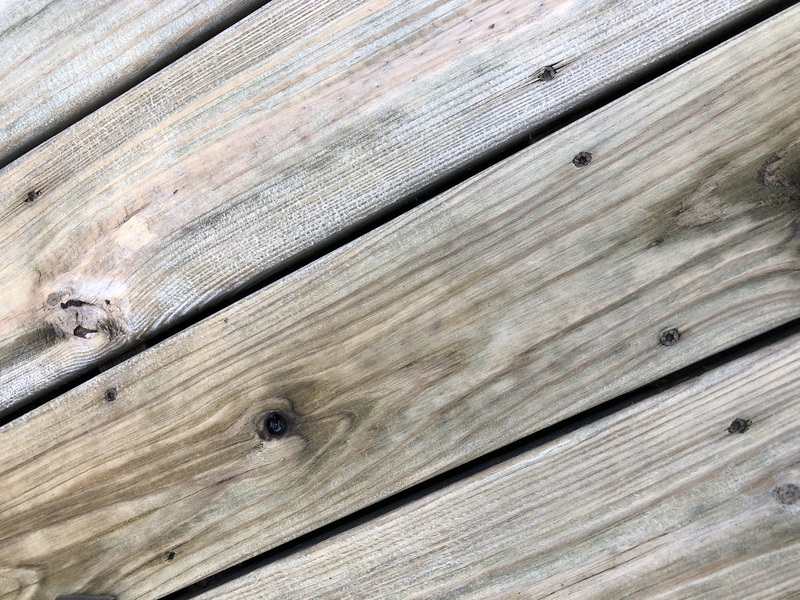 I tried Sherwin-Williams Revive to clean our 1-yr old cedar deck— sprayed the product on, waited 15 min, then power washed off. 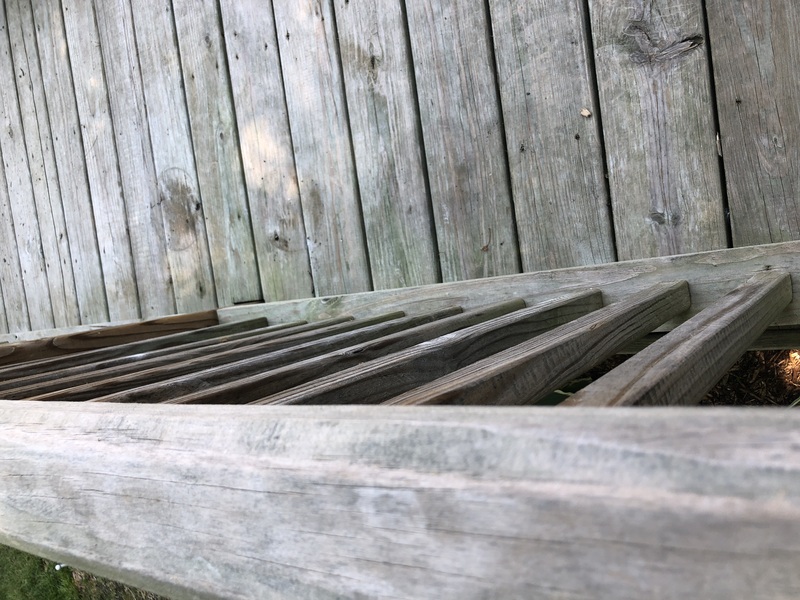 There’s still gray material left on the deck, and I can see the marks where the power washer was closer than another place. I’m abandoning the SW product and ordering RAD. Does it help to power wash first to get the bulk of the gray stuff off and then apply RAD and rinse? Do I need to keep cleaning until all the gray material is gone 100%? 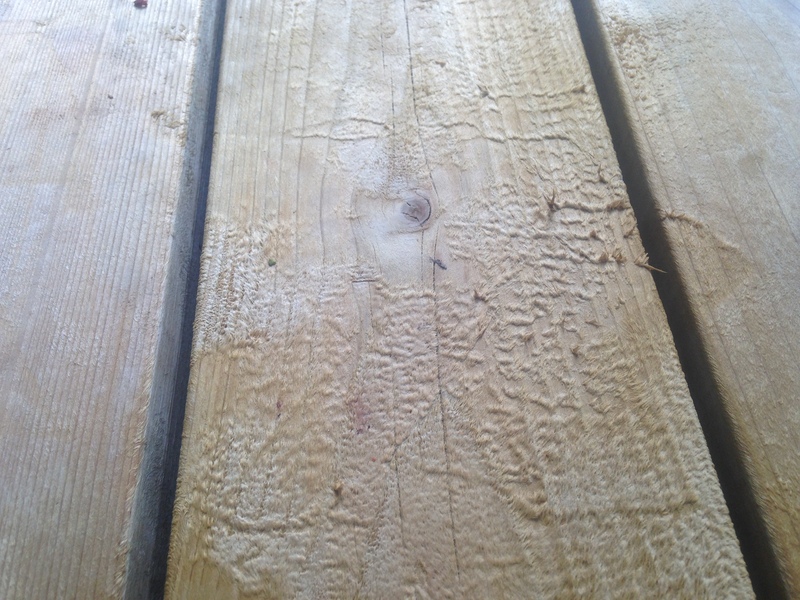 Also, when spraying, some boards get fuzzy— do I sand those after cleaning but before brightening? No need to pressure wash first. Try and remove 90-95%. A little bit of gray will not matte. Fuzzies are from oxidation. Sand those off if needed. Where do you purchase this RAD product. I have called various suppliers. Thank you. We have Sherwin Williams Deckscapes (paint). What us best to remove it or am I stuck with paint. It has mold and has faded a lot. You will need to sand off a paint. Strippers will not remove it. 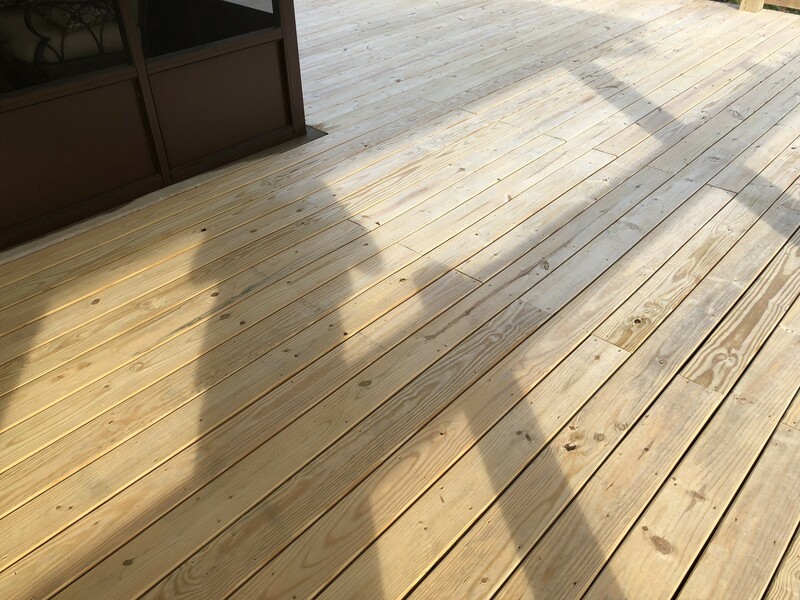 Installed a new greenwood treated deck around our Wisconsin log home (wooded) 8 months ago and now are preparing to stain. As the wood is new, is it necessary to power wash before using the RAD cleaner? If so, is it just a light once-over? You pressure wash while using the RAD Step 1 cleaner, not before. I have an IPE deck on an island in New England. Have replaced most boards on deck(appx 2000 soft) Older boards now showing mold and mildew. Would like to give deck uniform look. Do I need to powerwash?….inconvenient….scrubbing sounds like an option I would prefer. Do you recommend a scrubber I can buy, with a handle? How long should I leave cleaner on before scrubbing? Will 2 packages of cleaner do the job? 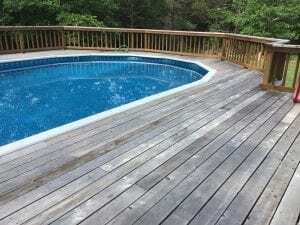 Use a deck cleaner and a pressure washer for the best result. Brightener after. Apply cleaner, wait 5-10 minutes and lightly pressure wash off. You will need 3 Kits for 2000 sq feet. Our deck is a typical candidate for restore-a-deck. However it is bordered by several mature cedars and three fruit trees and a number of flowering plants. What effect, if any, do such chemicals as restore-a-deck have on these plants? Proabbly no effect but tarp anything that you can so there are no issues from overspray while working. 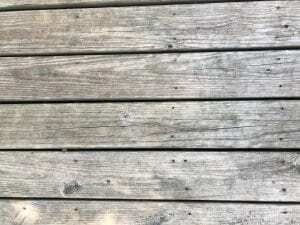 HELP: Deck constructed 3 1/2 months ago was cleaned with RAD cleaner/brightener. Didn’t remove graying so pressure washed. Still gray so used a second RAD kit. Again graying remained and have pressure washed two more times. Cleaning wasn’t performed in direct sunlight. Mixed cleaner in five gallon bucket and applied with pump sprayer. Very little foaming which I attributed to new deck not being very dirty. Only noticed small amount of crystals not dissolved but never clogged sprayer. Based on pictures do you think deck is ready for stain? Plan on sanding some and using Armstrong Clark semi transparent. Thanks for any help you can provide. Yes it is ready to be stained. 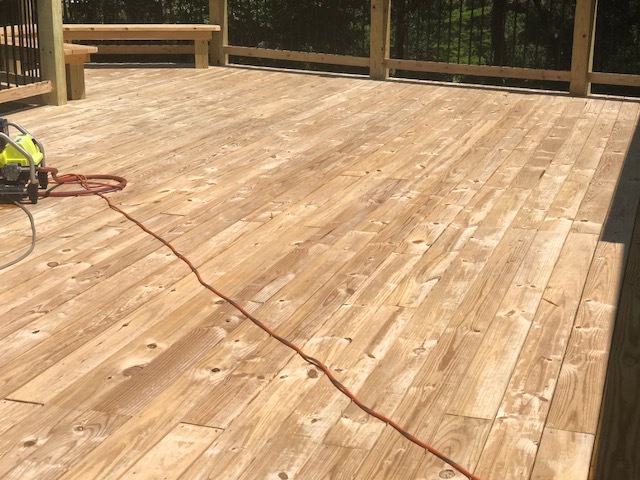 My cedar deck is only 6 months old – do I need to use a cleaner / brighter on it before staining (with twp 1500)? How do I know when stripped completely? Yes, on color change. Also OneTime typically turns dark brown in color after being outside for a years. This should come off. 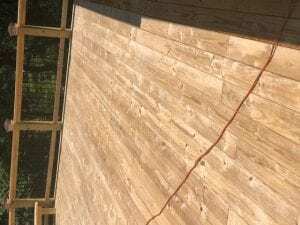 Will Resore A Deck stripper remove One Time Wood? This was the natural version. Hello, we have used it on Onetime. Works decently but we had to go over it twice. You may be using the wrong product for prep. Might need to be stripped and brightened instead of cleaned and brightened. Can I use Defy Extreme Stain after cleaning my cedar deck with Restore-A-Deck? I want the Redwood color and the water-based Restore-A-Deck does not come in that color. 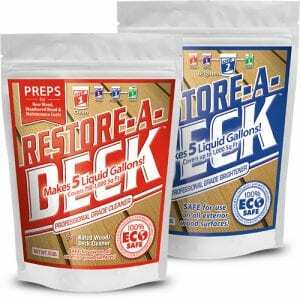 Yes, you can use the Restore A Deck prep products as prep for any stain brand. Where can I buy RAD? Do I need to order on-line only? Why is it that all your “top rated” cleaners,strippers, brightners and stains are ALL listed for sale on Restore A Deck website. Does this sites owner own a stake in RAD? Literally all 4 different products brands they sell are listed here in top 5 in each category. How can I trust this sites reviews with that being said? We give full disclosure of who we are and where our experience comes from on the front page and very first article. Our reviews/articles come from our experience as contractors for 25+ years. Consumer reviews and star ratings come from the 37,000 people how have contributed in the last 7-8 years. Best to read both our experiences and consumer experiences so you can make an educated decision on what to purchase. FYI, the video above is from a consumer who tried and tested the RAD products and he has no relation to this site or RAD products in any way. I have a covered outside deck that HAS been stained two years ago. I just want to clean it not restain it. Lots of dirt and mildew on it. Please recommend the best cleaner. It is virtually impossible to just clean it after two years and not have to reapply another coat of stain. This would depend though on the brand and type of stain you used last time? ok. I will restain. What is the best cleaning product??? The RAD products are what we use. No that is not possible. When you clean, it will remove the silver (oxidation) and any dirt, mildew etc. It will gray again though in 6-12 months if you do not stain the wood. Thank you. What do you suggest we clean with? 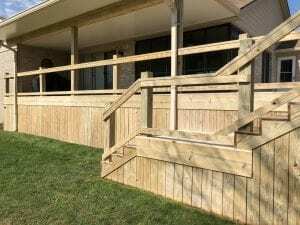 The Restore A Deck products.